A disc brake is a type of brake that uses calipers to squeeze pairs of pads against a disc or "rotor" to create friction. This action slows the rotation of a shaft, such as a vehicle axle, either to reduce its rotational speed or to hold it stationary. The energy of motion is converted into waste heat which must be dispersed. Hydraulically actuated disc brakes are the most commonly used form of brake for motor vehicles, but the principles of a disc brake are applicable to almost any rotating shaft. Development of disc-type brakes began in England in the 1890s. In 1902, the Lanchester Motor Company designed brakes that looked and operated in a similar way to a modern disc-brake system even though the disc was thin and a cable activated the brake pad. Other designs were not practical or widely available in cars for another 60 years. Successful application began in airplanes before World War II, and even the German Tiger tank was fitted with discs in 1942. After the war, technological progress began to arrive in the 1950s, leading to a critical demonstration of superiority at the 1953 24 Hours of Le Mans race, which required braking from high speeds several times per lap. The Jaguar racing team won, using disc brake equipped cars, with much of the credit being given to the brakes' superior performance over rivals equipped with drum brakes. Mass production began with the 1955 Citroën DS. Compared to drum brakes, disc brakes offer better stopping performance because the disc is more readily cooled. As a consequence discs are less prone to the brake fade caused when brake components overheat. Disc brakes also recover more quickly from immersion (wet brakes are less effective than dry ones). Most drum brake designs have at least one leading shoe, which gives a servo-effect. By contrast, a disc brake has no self-servo effect and its braking force is always proportional to the pressure placed on the brake pad by the braking system via any brake servo, braking pedal, or lever. This tends to give the driver better "feel" and helps to avoid impending lockup. Drums are also prone to "bell mouthing" and trap worn lining material within the assembly, both causes of various braking problems. The disc is usually made of cast iron, but may in some cases be made of composites such as reinforced carbon–carbon or ceramic matrix composites. 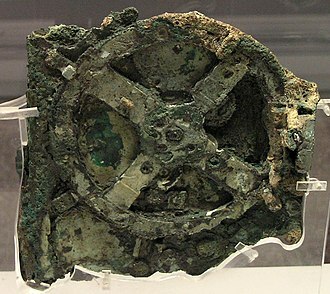 This is connected to the wheel and/or the axle. To slow down the wheel, friction material in the form of brake pads, mounted on the brake caliper, is forced mechanically, hydraulically, pneumatically, or electromagnetically against both sides of the disc. Friction causes the disc and attached wheel to slow or stop. Development of disc brakes began in England in the 1890s. The first caliper-type automobile disc brake was patented by Frederick William Lanchester in his Birmingham factory in 1902 and used successfully on Lanchester cars. However, the limited choice of metals in this period meant that he had to use copper as the braking medium acting on the disc. The poor state of the roads at this time, no more than dusty, rough tracks, meant that the copper wore quickly making the system impractical. 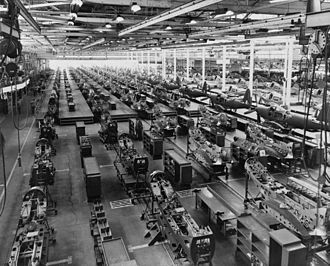 Successful application began in airplanes and tanks before and during World War II. In Britain, the Daimler Company used disc brakes on its Daimler Armoured Car of 1939, the disc brakes, made by the Girling company, were necessary because in that four-wheel drive (4x4) vehicle the epicyclic final drive was in the wheel hubs and therefore left no room for conventional hub-mounted drum brakes. At Germany's Argus Motoren, Hermann Klaue (1912-2001) had patented disc brakes in 1940. Argus supplied wheels fitted with disc brakes e.g. for the Arado Ar 96. The German Tiger I heavy tank, was introduced in 1942 with a 55 cm Argus-Werke disc on each drive shaft. The American Crosley Hot Shot is often given credit for the first production disc brakes. For six months in 1950, Crosley built a car with these brakes, then returned to drum brakes. Lack of sufficient research caused reliability problems, such as sticking and corrosion, especially in regions using salt on winter roads. Drum brake conversions for Hot Shots were quite popular. The Crosley disc was a Goodyear development, a caliper type with ventilated disc, originally designed for aircraft applications. Chrysler developed a unique braking system, offered from 1949 to 1953. Instead of the disc with caliper squeezing on it, this system used twin expanding discs that rubbed against the inner surface of a cast-iron brake drum, which doubled as the brake housing. The discs spread apart to create friction against the inner drum surface through the action of standard wheel cylinders. Because of the expense, the brakes were only standard on the Chrysler Crown and the Town and Country Newport in 1950. They were optional, however, on other Chryslers, priced around $400, at a time when an entire Crosley Hot Shot retailed for $935. This four-wheel disc brake system was built by Auto Specialties Manufacturing Company (Ausco) of St. Joseph, Michigan, under patents of inventor H.L. Lambert, and was first tested on a 1939 Plymouth. Chrysler discs were "self energizing," in that some of the braking energy itself contributed to the braking effort. This was accomplished by small balls set into oval holes leading to the brake surface. When the disc made initial contact with the friction surface, the balls would be forced up the holes forcing the discs further apart and augmenting the braking energy. This made for lighter braking pressure than with calipers, avoided brake fade, promoted cooler running, and provided one-third more friction surface than standard Chrysler twelve-inch drums. Today's owners consider the Ausco-Lambert very reliable and powerful, but admit its grabbiness and sensitivity. The first use of disc brakes in racing was in 1951, one of the BRM Type 15s using a Girling-produced set, a first for a Formula One car. Reliable caliper-type disc brakes later appeared in 1953 on the Jaguar C-Type racing car. These brakes helped the company to win the 1953 24 Hours of Le Mans, developed in the UK by Dunlop. That same year, the aluminum bodied Austin-Healey 100S, of which 50 were made, was the first car sold to the public to have disc brakes, fitted to all 4 wheels. The first mass production use of the modern disc brake was in 1955, on the Citroën DS, which featured caliper-type front disc brakes among its many innovations. These discs were mounted inboard near the transmission, and were powered by the vehicle's central hydraulic system. This model went on to sell 1.5 million units over 20 years with the same brake setup. The Jensen 541, with four-wheel disc brakes, followed in 1956. Triumph exhibited a 1956 TR3 with disc brakes to the public, but the first production cars with Girling front-disc brakes were made in September 1956. 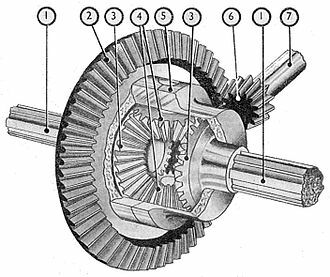 Many early implementations for automobiles located the brakes on the inboard side of the driveshaft, near the differential, while most brakes today are located inside the wheels. An inboard location reduces the unsprung weight and eliminates a source of heat transfer to the tires. Historically, brake discs were manufactured throughout the world with a strong concentration in Europe and America. Between 1989 and 2005, manufacturing of brake discs migrated predominantly to China. After a 10-year hiatus, America built another production automobile equipped with disc brakes - the 1963 Studebaker Avanti (the Bendix system was optional on some of the other Studebaker models). Front disc brakes became standard equipment in 1965 on the Rambler Marlin (the Bendix units were optional on all American Motors' Rambler Classic and Ambassador models), as well as on the Ford Thunderbird, and the Lincoln Continental. A four-wheel disc brake system was also introduced in 1965 on the Chevrolet Corvette Stingray. The first motorcycles to use disc brakes were racing vehicles. MV Agusta was the first to offer a front disc brake motorcycle to the public on a small scale in 1965, on their relatively expensive 600 touring motorcycle, using a mechanical brake linkage. In 1969 Honda introduced the more affordable CB750, which had a single hydraulically-actuated front disc brake (and a rear drum brake), and which sold in huge numbers. Disc brakes are now common on motorcycles, mopeds and even mountain bikes. The brake disc (or rotor) is the rotating part of a wheel's disc brake assembly, against which the brake pads are applied. 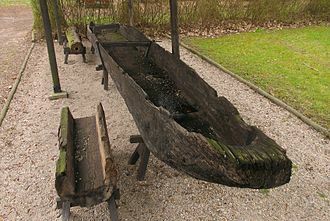 The material is typically gray iron, a form of cast iron. The design of the discs varies somewhat. Some are simply solid, but others are hollowed out with fins or vanes joining together the disc's two contact surfaces (usually included as part of a casting process). The weight and power of the vehicle determines the need for ventilated discs. The "ventilated" disc design helps to dissipate the generated heat and is commonly used on the more-heavily loaded front discs. Discs for motorcycles, bicycles, and many cars often have holes or slots cut through the disc. This is done for better heat dissipation, to aid surface-water dispersal, to reduce noise, to reduce mass, or for marketing cosmetics. Slotted discs have shallow channels machined into the disc to aid in removing dust and gas. Slotting is the preferred method in most racing environments to remove gas and water and to deglaze brake pads. Some discs are both drilled and slotted. Slotted discs are generally not used on standard vehicles because they quickly wear down brake pads; however, this removal of material is beneficial to race vehicles since it keeps the pads soft and avoids vitrification of their surfaces. On the road, drilled or slotted discs still have a positive effect in wet conditions because the holes or slots prevent a film of water building up between the disc and the pads. Lambretta introduced the first high-volume production use of a single, floating, front disc brake, enclosed in a ventilated cast alloy hub and actuated by cable, on the 1962 TV175, followed by the range-topping GT200 in 1964. The 1969 Honda CB750 introduced hydraulic disc brakes on a large scale to the wide motorcycle public, following the lesser known 1965 MV Agusta 600, which had cable-operated mechanical actuation. Unlike car disc brakes that are buried within the wheel, bike disc brakes are in the airstream and have optimum cooling. Although cast iron discs have a porous surface which give superior braking performance, such discs rust in the rain and become unsightly. Accordingly, motorcycle discs are usually stainless steel, drilled, slotted or wavy to disperse rain water. 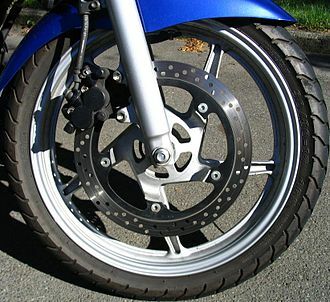 Modern motorcycle discs tend to have a floating design whereby the disc "floats" on bobbins and can move slightly, allowing better disc centering with a fixed caliper. A floating disc also avoids disc warping and reduces heat transfer to the wheel hub. Calipers have evolved from simple single-piston units to two-, four- and even six-piston items. Compared to cars, motorcycles have a higher center of mass:wheelbase ratio, so they experience more weight transfer when braking. Front brakes absorb most of the braking forces, while the rear brake serves mainly to balance the motorcycle during braking. Modern sport bikes typically have twin large front discs, with a much smaller single rear disc. Bikes that are particularly fast or heavy may have vented discs. 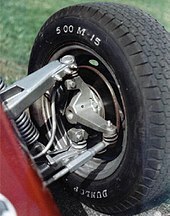 Early disc brakes (such as on the early Honda fours and the Norton Commando) sited the calipers on top of the disc, ahead of the fork slider. Although this gave the brake pads better cooling, it is now almost universal practice to site the caliper behind the slider (to reduce the angular momentum of the fork assembly). Rear disc calipers may be mounted above (e.g. BMW R1100S) or below (e.g. Yamaha TRX850) the swinging arm: a low mount is marginally better for CG purposes, while an upper siting keeps the caliper cleaner and better-protected from road obstacles. One problem with motorcycle disc brakes is that when a bike gets into a violent tank-slapper (high speed oscillation of the front wheel) the brake pads in the calipers are forced away from the discs, so when the rider applies the brake lever the caliper pistons push the pads towards the discs without actually making contact. The rider immediately brakes harder, which pushes the pads onto the disc much more aggressively than during normal braking. For example, The Michele Pirro incident at Mugello,Italy 1st June 2018. At least one manufacturer has developed a system to counter the pads being forced away. A modern development, particularly on inverted ("upside down", or "USD") forks is the radially mounted caliper. Although these are fashionable, there is no evidence that they improve braking performance, nor do they add to the stiffness of the fork. (Lacking the option of a fork brace, USD forks may be best stiffened by an oversize front axle). Disc brakes are increasingly used on very large and heavy road vehicles, where previously large drum brakes were nearly universal. One reason is that the disc's lack of self-assist makes brake force much more predictable, so peak brake force can be raised without more risk of braking-induced steering or jackknife on articulated vehicles. Another is disc brakes fade less when hot, and in a heavy vehicle air and rolling drag and engine braking are small parts of total braking force, so brakes are used harder than on lighter vehicles, and drum brake fade can occur in a single stop. For these reasons, a heavy truck with disc brakes can stop in about 120% the distance of a passenger car, but with drums stopping takes about 150% the distance. In Europe, stopping distance regulations essentially require disc brakes for heavy vehicles. In the U.S., drums are allowed and are typically preferred for their lower purchase price, despite higher total lifetime cost and more frequent service intervals. Still-larger discs are used for railroad cars, trams and some airplanes. Passenger rail cars and light rail vehicles often use disc brakes outboard of the wheels, which helps ensure a free flow of cooling air. Some modern passenger rail cars, such as the Amfleet II cars, use inboard disc brakes. This reduces wear from debris, and provides protection from rain and snow, which would make the discs slippery and unreliable. However, there is still plenty of cooling for reliable operation. Some airplanes have the brake mounted with very little cooling, and the brake gets quite hot in a stop. This is acceptable as there is sufficient time for cooling, where the maximum braking energy is very predictable. Should the braking energy exceed the maximum, for example during an emergency occurring during take-off, aircraft wheels can be fitted with a fusible plug to prevent the tyre bursting. This is a milestone test in aircraft development. For automotive use, disc brake discs are commonly made of grey iron. The SAE maintains a specification for the manufacture of grey iron for various applications. For normal car and light-truck applications, SAE specification J431 G3000 (superseded to G10) dictates the correct range of hardness, chemical composition, tensile strength, and other properties necessary for the intended use. 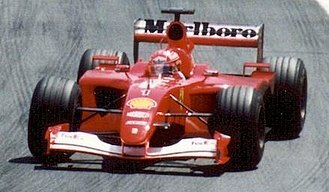 Some racing cars and airplanes use brakes with carbon fiber discs and carbon fiber pads to reduce weight. Wear rates tend to be high, and braking may be poor or grabby until the brake is hot. In racing and very-high-performance road cars, other disc materials have been employed. 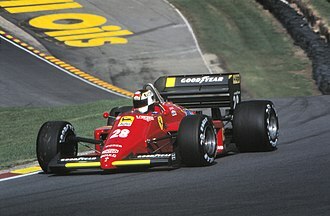 Reinforced carbon discs and pads inspired by aircraft braking systems such as those used on Concorde were introduced in Formula One by Brabham in conjunction with Dunlop in 1976. Carbon–carbon braking is now used in most top-level motorsport worldwide, reducing unsprung weight, giving better frictional performance and improved structural properties at high temperatures, compared to cast iron. Carbon brakes have occasionally been applied to road cars, by the French Venturi sports car manufacturer in the mid 1990s for example, but need to reach a very high operating temperature before becoming truly effective and so are not well suited to road use. The extreme heat generated in these systems is visible during night racing, especially at shorter tracks. It is not uncommon to see the brake discs glowing red during use. Ceramic discs are used in some high-performance cars and heavy vehicles. The first development of the modern ceramic brake was made by British engineers for TGV applications in 1988. The objective was to reduce weight, the number of brakes per axle, as well as provide stable friction from high speeds and all temperatures. The result was a carbon-fibre-reinforced ceramic process which is now used in various forms for automotive, railway, and aircraft brake applications. Due to the high heat tolerance and mechanical strength of ceramic composite discs, they are often used on exotic vehicles where the cost is not prohibitive. They are also found in industrial applications where the ceramic disc's light weight and low-maintenance properties justify the cost. Composite brakes can withstand temperatures that would damage steel discs. Porsche's Composite Ceramic Brakes (PCCB) are siliconized carbon fiber, with high temperature capability, a 50% weight reduction over iron discs (hence reducing the vehicle's unsprung weight), a significant reduction in dust generation, substantially extended maintenance intervals, and enhanced durability in corrosive environments. Found on some of their more expensive models, it is also an optional brake for all street Porsches at added expense. They can be recognized by the bright yellow paintwork on the aluminum six-piston calipers. The discs are internally vented much like cast-iron ones, and cross-drilled. In automotive applications, the piston seal has a square cross section, also known as a square-cut seal. As the piston moves in and out, the seal drags and stretches on the piston, causing the seal to twist. The seal distorts approximately 1/10 of a millimeter. 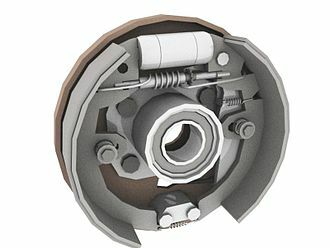 The piston is allowed to move out freely, but the slight amount of drag caused by the seal stops the piston from fully retracting to its previous position when the brakes are released, and so takes up the slack caused by the wear of the brake pads, eliminating the need for return springs. In some rear disc calipers, the parking brake activates a mechanism inside the caliper that performs some of the same function. Discs are usually damaged in one of four ways: scarring, cracking, warping or excessive rusting. Service shops will sometimes respond to any disc problem by changing out the discs entirely, This is done mainly where the cost of a new disc may actually be lower than the cost of labour to resurface the old disc. Mechanically this is unnecessary unless the discs have reached manufacturer's minimum recommended thickness, which would make it unsafe to use them, or vane rusting is severe (ventilated discs only). Most leading vehicle manufacturers recommend brake disc skimming (US: turning) as a solution for lateral run-out, vibration issues and brake noises. The machining process is performed in a brake lathe, which removes a very thin layer off the disc surface to clean off minor damage and restore uniform thickness. Machining the disc as necessary will maximise the mileage out of the current discs on the vehicle. Run-out is measured using a dial indicator on a fixed rigid base, with the tip perpendicular to the brake disc's face. It is typically measured about 1⁄2 in (12.7 mm) from the outside diameter of the disc. The disc is spun. The difference between minimum and maximum value on the dial is called lateral run-out. Typical hub/disc assembly run-out specifications for passenger vehicles are around 0.002 in (0.0508 mm). Runout can be caused either by deformation of the disc itself or by runout in the underlying wheel hub face or by contamination between the disc surface and the underlying hub mounting surface. 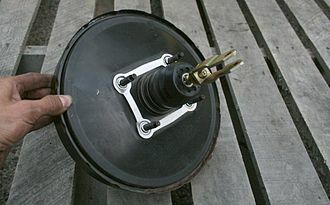 Determining the root cause of the indicator displacement (lateral runout) requires disassembly of the disc from the hub. Disc face runout due to hub face runout or contamination will typically have a period of 1 minimum and 1 maximum per revolution of the brake disc. Discs can be machined to eliminate thickness variation and lateral run-out. Machining can be done in situ (on-car) or off-car (bench lathe). Both methods will eliminate thickness variation. Machining on-car with proper equipment can also eliminate lateral run-out due to hub-face non-perpendicularity. Incorrect fitting can distort (warp) discs. The disc's retaining bolts (or the wheel/lug nuts, if the disc is sandwiched in place by the wheel) must be tightened progressively and evenly. The use of air tools to fasten lug nuts can be bad practice, unless a torque wrench is used for final tightening. The vehicle manual will indicate the proper pattern for tightening as well as a torque rating for the bolts. Lug nuts should never be tightened in a circle. Some vehicles are sensitive to the force the bolts apply and tightening should be done with a torque wrench. Often uneven pad transfer is confused for disc warping. The majority of brake discs diagnosed as "warped" are actually the result of uneven transfer of pad material. Uneven pad transfer can lead to thickness variation of the disc. When the thicker section of the disc passes between the pads, the pads will move apart and the brake pedal will raise slightly; this is pedal pulsation. The thickness variation can be felt by the driver when it is approximately 0.17 mm (0.0067 in) or greater (on automobile discs). Thickness variation has many causes, but there are three primary mechanisms which contribute to the propagation of disc thickness variations. The first is improper selection of brake pads. Pads which are effective at low temperatures, such as when braking for the first time in cold weather, often are made of materials which decompose unevenly at higher temperatures. This uneven decomposition results in uneven deposition of material onto the brake disc. Another cause of uneven material transfer is improper break-in of a pad/disc combination. For proper break-in, the disc surface should be refreshed (either by machining the contact surface or by replacing the disc) every time the pads are changed. Once this is done, the brakes are heavily applied multiple times in succession. This creates a smooth, even interface between the pad and the disc. When this is not done properly the brake pads will see an uneven distribution of stress and heat, resulting in an uneven, seemingly random, deposition of pad material. The third primary mechanism of uneven pad material transfer is "pad imprinting." This occurs when the brake pads are heated to the point that the material begins to break-down and transfer to the disc. In a properly broken-in brake system (with properly selected pads), this transfer is natural and actually is a major contributor to the braking force generated by the brake pads. However, if the vehicle comes to a stop and the driver continues to apply the brakes, the pads will deposit a layer of material in the shape of the brake pad. This small thickness variation can begin the cycle of uneven pad transfer. Once the disc has some level of variation in thickness, uneven pad deposition can accelerate, sometimes resulting in changes to the crystal structure of the metal that composes the disc. As the brakes are applied, the pads slide over the varying disc surface. As the pads pass by the thicker section of the disc, they are forced outwards. The foot of the driver applied to the brake pedal naturally resists this change, and thus more force is applied to the pads. The result is that the thicker sections see higher levels of stress. This causes uneven heating of the surface of the disc, which causes two major issues. As the brake disc heats unevenly it also expands unevenly. The thicker sections of the disc expand more than the thinner sections due to seeing more heat, and thus the difference in thickness is magnified. Also, the uneven distribution of heat results in further uneven transfer of pad material. The result is that the thicker-hotter sections receive even more pad material than the thinner-cooler sections, contributing to a further increase in the variation in the disc's thickness. In extreme situations, this uneven heating can cause the crystal structure of the disc material to change. When the hotter sections of the discs reach extremely high temperatures (1,200–1,300 °F or 649–704 °C ), the metal can undergo a phase transformation and the carbon which is dissolved in the steel can precipitate out to form carbon-heavy carbide regions known as cementite. This iron carbide is very different from the cast iron the rest of the disc is composed of. It is extremely hard, brittle, and does not absorb heat well. After cementite is formed, the integrity of the disc is compromised. Even if the disc surface is machined, the cementite within the disc will not wear or absorb heat at the same rate as the cast iron surrounding it, causing the uneven thickness and uneven heating characteristics of the disc to return. Scarring (US: Scoring) can occur if brake pads are not changed promptly when they reach the end of their service life and are considered worn out. Once enough of the friction material has worn away, the pad's steel backing plate (for glued pads) or the pad retainer rivets (for riveted pads) will bear upon the disc's wear surface, reducing braking power and making scratches on the disc. Generally a moderately scarred / scored disc, which operated satisfactorily with existing brake pads, will be equally usable with new pads. If the scarring is deeper but not excessive, it can be repaired by machining off a layer of the disc's surface. This can only be done a limited number of times as the disc has a minimum rated safe thickness. The minimum thickness value is typically cast into the disc during manufacturing on the hub or the edge of the disc. In Pennsylvania, which has one of the most rigorous auto safety inspection programs in North America, an automotive disc cannot pass safety inspection if any scoring is deeper than .015 inches (0.38 mm), and must be replaced if machining will reduce the disc below its minimum safe thickness. To prevent scarring, it is prudent to periodically inspect the brake pads for wear. A tire rotation is a logical time for inspection, since rotation must be performed regularly based on vehicle operation time and all wheels must be removed, allowing ready visual access to the brake pads. Some types of alloy wheels and brake arrangements will provide enough open space to view the pads without removing the wheel. When practical, pads that are near the wear-out point should be replaced immediately, as complete wear out leads to scarring damage and unsafe braking. Many disc brake pads will include some sort of soft steel spring or drag tab as part of the pad assembly, which drags on the disc when the pad is nearly worn out. The produces a moderately loud squealing noise, alerting the driver that service is required. This will not normally scar the disc if the brakes are serviced promptly. A set of pads can be considered for replacement if the thickness of the pad material is the same or less than the thickness of the backing steel. In Pennsylvania, the standard is 1/32". Cracking is limited mostly to drilled discs, which may develop small cracks around edges of holes drilled near the edge of the disc due to the disc's uneven rate of expansion in severe duty environments. Manufacturers that use drilled discs as OEM typically do so for two reasons: appearance, if they determine that the average owner of the vehicle model will prefer the look while not overly stressing the hardware; or as a function of reducing the unsprung weight of the brake assembly, with the engineering assumption that enough brake disc mass remains to absorb racing temperatures and stresses. A brake disc is a heat sink, but the loss of heat sink mass may be balanced by increased surface area to radiate away heat. Small hairline cracks may appear in any cross drilled metal disc as a normal wear mechanism, but in the severe case the disc will fail catastrophically. No repair is possible for the cracks, and if cracking becomes severe, the disc must be replaced. These cracks occur due to the phenomenon of low cycle fatigue as a result of repeated hard braking. The discs are commonly made from cast iron and a certain amount of surface rust is normal. The disc contact area for the brake pads will be kept clean by regular use, but a vehicle that is stored for an extended period can develop significant rust in the contact area that may reduce braking power for a time until the rusted layer is worn off again. Rusting can also lead to disc warping when brakes are re-activated after storage because of differential heating between unrusted areas left covered by pads and rust around the majority of the disc area surface. Over time, vented brake discs may develop severe rust corrosion inside the ventilation slots, compromising the strength of the structure and needing replacement. The brake caliper is the assembly which houses the brake pads and pistons. The pistons are usually made of plastic, aluminium or chrome-plated steel. Calipers are of two types, floating or fixed. A fixed caliper does not move relative to the disc and is thus less tolerant of disc imperfections. It uses one or more pairs of opposing pistons to clamp from each side of the disc, and is more complex and expensive than a floating caliper. 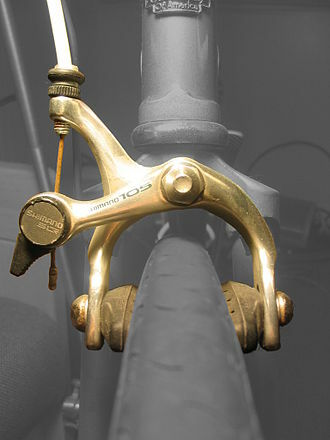 A floating caliper (also called a "sliding caliper") moves with respect to the disc, along a line parallel to the axis of rotation of the disc; a piston on one side of the disc pushes the inner brake pad until it makes contact with the braking surface, then pulls the caliper body with the outer brake pad so pressure is applied to both sides of the disc. Floating caliper (single piston) designs are subject to sticking failure, caused by dirt or corrosion entering at least one mounting mechanism and stopping its normal movement. This can lead to the caliper's pads rubbing on the disc when the brake is not engaged or engaging it at an angle. Sticking can result from infrequent vehicle use, failure of a seal or rubber protection boot allowing debris entry, dry-out of the grease in the mounting mechanism and subsequent moisture incursion leading to corrosion, or some combination of these factors. Consequences may include reduced fuel efficiency, extreme heating of the disc or excessive wear on the affected pad. 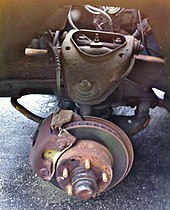 A sticking front caliper may also cause steering vibration. Another type of floating caliper is a swinging caliper. Instead of a pair of horizontal bolts that allow the caliper to move straight in and out respective to the car body, a swinging caliper utilizes a single, vertical pivot bolt located somewhere behind the axle centerline. 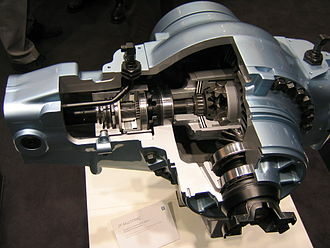 When the driver presses the brakes, the brake piston pushes on the inside piston and rotates the whole caliper inward, when viewed from the top. Because the swinging caliper's piston angle changes relative to the disc, this design uses wedge-shaped pads that are narrower in the rear on the outside and narrower on the front on the inside. Various types of brake calipers are also used on bicycle rim brakes. The most common caliper design uses a single hydraulically actuated piston within a cylinder, although high performance brakes use as many as twelve. Modern cars use different hydraulic circuits to actuate the brakes on each set of wheels as a safety measure. The hydraulic design also helps multiply braking force. The number of pistons in a caliper is often referred to as the number of 'pots', so if a vehicle has 'six pot' calipers it means that each caliper houses six pistons. Brake failure can result from failure of the piston to retract, which is usually a consequence of not operating the vehicle during prolonged storage outdoors in adverse conditions. On high-mileage vehicles, the piston seals may leak, which must be promptly corrected. Brake pads are designed for high friction with brake pad material embedded in the disc in the process of bedding while wearing evenly. Friction can be divided into two parts. They are: adhesive and abrasive. Depending on the properties of the material of both the pad and the disc and the configuration and the usage, pad and disc wear rates will vary considerably. The properties that determine material wear involve trade-offs between performance and longevity. The brake pads must usually be replaced regularly (depending on pad material, and drivestyle), and some are equipped with a mechanism that alerts drivers that replacement is needed, such as a thin piece of soft metal that rubs against the disc when the pads are too thin causing the brakes to squeal, a soft metal tab embedded in the pad material that closes an electric circuit and lights a warning light when the brake pad gets thin, or an electronic sensor. Generally road-going vehicles have two brake pads per caliper, while up to six are installed on each racing caliper, with varying frictional properties in a staggered pattern for optimum performance. Early brake pads (and linings) contained asbestos, producing dust which should not be inhaled. Although newer pads can be made of ceramics, Kevlar, and other plastics, inhalation of brake dust should still be avoided regardless of material. Sometimes a loud noise or high pitched squeal occurs when the brakes are applied. Most brake squeal is produced by vibration (resonance instability) of the brake components, especially the pads and discs (known as force-coupled excitation). This type of squeal should not negatively affect brake stopping performance. Techniques include adding chamfer pads to the contact points between caliper pistons and the pads, the bonding insulators (damping material) to pad backplate, the brake shims between the brake pad and pistons, etc. All should be coated with an extremely high temperature, high solids lubricant to help reduce squeal. This allows the metal to metal parts to move independently of each other and thereby eliminate the buildup of energy that can create a frequency that is heard as brake squeal, groan, or growl. It is inherent that some pads are going to squeal more given the type of pad and its usage case. Pads typically rated to withstand very high temperatures for extended periods tend to produce high amounts of friction leading to more noise during brake application. Cold weather combined with high early-morning humidity (dew) often worsens brake squeal, although the squeal generally stops when the lining reaches regular operating temperatures. This more strongly affects pads meant to be used at higher temperatures. Dust on the brakes may also cause squeal and commercial brake cleaning products are designed to remove dirt and other contaminants. Pads without a proper amount of transfer material could also squeal, this can be remedied by bedding or re-bedding the brake pads to brake discs. Some lining wear indicators, located either as a semi-metallic layer within the brake pad material or with an external "sensor", are also designed to squeal when the lining is due for replacement. The typical external sensor is fundamentally different from the noises described above (when the brakes are applied) because the wear sensor noise typically occurs when the brakes are not used. The wear sensor may only create squeal under braking when it first begins to indicate wear but is still a fundamentally different sound and pitch. The judder phenomenon can be classified into two distinct subgroups: hot (or thermal), or cold judder. Hot judder is usually produced as a result of longer, more moderate braking from high speed where the vehicle does not come to a complete stop. It commonly occurs when a motorist decelerates from speeds of around 120 km/h (74.6 mph) to about 60 km/h (37.3 mph), which results in severe vibrations being transmitted to the driver. These vibrations are the result of uneven thermal distributions, or hot spots. Hot spots are classified as concentrated thermal regions that alternate between both sides of a disc that distort it in such a way that produces a sinusoidal waviness around its edges. Once the brake pads (friction material/brake lining) come in contact with the sinusoidal surface during braking, severe vibrations are induced, and can produce hazardous conditions for the person driving the vehicle. Cold judder, on the other hand, is the result of uneven disc wear patterns or disc thickness variation (DTV). These variations in the disc surface are usually the result of extensive vehicle road usage. DTV is usually attributed to the following causes: waviness and roughness of disc surface, misalignment of axis (runout), elastic deflection, wear and friction material transfers. 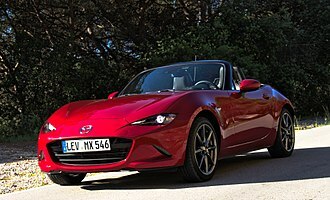 Either type could potentially fixed by ensuring a clean mounting surface on either side of the brake disc between the wheel hub and brake disc hub before usage and paying attention to imprinting after extended usage by leaving the brake pedal heavily depressed at the end of heavy usage. Sometimes a bed in procedure can clean and minimize DTV and lay a new even transfer layer between the pad and brake disc. However it will not eliminate hot spots or excessive run out. When braking force is applied, the act of abrasive friction between the brake pad and the disc wears both the disc and pad away. The brake dust that is seen deposited on wheels, calipers and other braking system components consists mostly of disc material. Brake dust can damage the finish of most wheels if not washed off. Generally, a brake pad that aggressively abrades more disc material away, such as metallic pads, will create more brake dust. Some higher performing pads for track use or towing use may wear away much quicker than a typical pad causing additional dust from heightened brake disc wear and brake pad wear. ^ Deaton, Jamie Page (11 November 2008). "How Brake Rotors Work". HowStuffWorks. Retrieved 26 November 2017. ^ "disc brake". Merriam-Webster Dictionary. 16 November 2017. Retrieved 26 November 2017. ^ a b c d e Lentinello, Richard (April 2011). "The first car with disc brakes really was . ." Hemmings Sports & Exotic Car. Retrieved 26 November 2017. ^ "Lexikon der Wehrmacht - Ar 96". www.lexikon-der-wehrmacht.de. Retrieved 15 April 2018. ^ "Tiger I Information Center - Transmission and Steering". www.alanhamby.com. Retrieved 15 April 2018. ^ a b c d e f g h i j k l Langworth, Richard M. (1994). Chrysler and Imperial: The Postwar Years. Motorbooks International. ISBN 0-87938-034-9. ^ Fearnley, Paul (13 June 2013). "Le Mans 1953: Jaguar's gigantic leap - History, Le Mans". Motor Sport Magazine. Retrieved 14 December 2015. ^ Lawrence, Mike (1991). A to Z of Sports Cars 1945–1990. Bay View Books. ISBN 978-1-870979-81-8. ^ October 17. The Motor. 1956. ^ Lentinello, Richard (April 2011). "The first car with disc brakes really was . ." Hemmings Sports & Exotic Car. Retrieved 5 May 2018. ^ "Why do we use disc brakes in front and drum brakes in rear?". Quora. August 2013. Retrieved 14 December 2015. ^ "The Avanti — Born in Palm Springs". Point Happy Interactive. Retrieved 14 December 2015. ^ Auto Editors ofConsumer Guide (17 December 2007). "1963–1964 Studebaker Avanti". auto.howstuffworks.com. Retrieved 14 December 2015. ^ Auto Editors of Consumer Guide (26 October 2007). "Introduction to the 1965–1967 AMC Marlin". auto.howstuffworks.com. Retrieved 14 December 2015. ^ a b "What's new at American Motors". Popular Science. 185 (4): 90–91. October 1964. Retrieved 14 December 2015. ^ Long, Brian (2007). The Book of the Ford Thunderbird from 1954. Veloce Publishing. p. 104. ISBN 978-1-904788-47-8. Retrieved 11 November 2010. ^ Auto Editors ofConsumer Guide (27 November 2007). "1964–1965 Lincoln Continental". auto.howstuffworks.com. Retrieved 14 December 2015. ^ Auto Editors of Consumer Guide (14 December 2015). "1965 Corvette". auto.howstuffworks.com. Retrieved 14 December 2015. ^ a b c Frank, Aaron (2003). Honda Motorcycles. MotorBooks/MBI. p. 80. ISBN 0-7603-1077-7. ^ a b Ihm, Mark. "Introduction to Gray Cast Iron Brake Rotor Metallurgy" (PDF). SAE. Retrieved 14 December 2015. ^ "AP Racing - Race Car - Brake Discs - Ventilated Discs". www.apracing.com. Retrieved 2018-11-21. ^ Glimmerveen, John. "Disc Brakes". About.com Autos. Retrieved 15 February 2015. ^ Kresnicka, Michael. "Disc Brake Tech". motorcycle.com. Retrieved 15 February 2015. ^ Sutherland, Howard (2004). Sutherland's Handbook for Bicycle Mechanics Chapter 11 - Brakes (PDF) (7th ed.). Sutherland's Bicycle Shop Aids. p. 13. Archived from the original (PDF) on 14 October 2013. Retrieved 15 February 2015. ^ Ganaway, Gary (2002-01-28). "Air Disc Brake Production, Use & Performance" (PDF). NDIA Tactical Wheeled Vehicles Conference, Monterey California. Retrieved 2010-11-11. ^ Henry, Alan (1985). Brabham, the Grand Prix Cars. Osprey. p. 163. ISBN 978-0-905138-36-7. ^ Mavrigian, Mike; Carley, Larry (1998). Brake Systems: OEM & Racing Brake Technology. HP Books. p. 81. ISBN 9781557882813. ^ Puhn, Fred (1987). Brake Handbook. HP Trade. p. 31. ISBN 9780895862327. ^ Smith, Carroll. "Warped- Brake Disc and Other Myths". Stoptech.com. Retrieved 18 January 2014. ^ Rashid, A., and Strömberg, N. (2013), "Sequential simulation of thermal stresses in disc brakes for repeated braking", Proceedings of the Institution of Mechanical Engineers, Part J: Journal of Engineering Tribology, v. 227(8), pp. 919–929. ^ Abdelahamid, M.K. (1997), "Brake judder analysis: Case studies", SAE, Technical Paper Series, no. 972027. ^ de Vries, A. et al. (1992), "The brake judder phenomenon", SAE Technical Paper Series, no. 920554. ^ a b Engel, G.H. et al. (1994), "System approach to brake judder", SAE Technical Paper Series, no. 945041. ^ Gassmann, S. et al. (1993), "Excitation and transfer mechanism of brake judder", SAE Technical Paper Series, no. 931880. ^ Jacobsson, H. (1996), "High speed disc brake judder – the influence of passing through critical speed", In EuroMech – 2nd European Nonlinear Oscillations Conference, Prague, no. 2, pp. 75–78. ^ Jacobsson, H. (1997), "Wheel suspension related disc brake judder", ASME, no. DETC97/VIB-4165, pp. 1–10. ^ Jacobsson, H. (1998), "Frequency Sweep Approach to Brake Judder, Licentiate of engineering", Chalmers University of Technology Sweden. ^ Jacobsson, H. (1999), SAE Technical Paper Series, no. 1999-01-1779, pp. 1–14. ^ Stringham, W. et al. (1993), "Brake roughness – disc brake torque variation", disc distortion and vehicle response, SAE Technical Paper Series, no. 930803. ^ Thoms, E. (1988), "Disc brakes for heavy vehicles", IMechE, pp. 133–137. ^ Anderson, E., et al. (1990), "Hot spotting in automotive friction systems", Wear, v. 135, pp. 319–337. ^ Barber, R., J. et al. (1985), "Implications of thermoelastic instabilities for the design of brakes", J. Tribology, v. 107, pp. 206–210. ^ Inoue, H. (1986), Analysis of brake judder caused by thermal deformation of brake discs, SAE Technical Paper Series, no. 865131. ^ a b Rhee, K.S. et al. (1989), "Friction–induced noise and vibration of disc brakes", Wear, v. 133, pp. 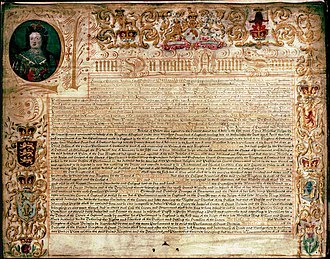 39–45. ^ J. Slavič, M.D. Bryant and M. Boltežar (2007), "A new approach to roughness-induced vibrations on a slider. ", J. Sound and Vibration, Vol. 306, Issues 3–5, 9 October 2007, pp. 732–750. ^ Kim, M.-G. et al. (1996), "Sensitivity analysis of chassis system to improve shimmy and brake judder vibration on the steering wheel", SAE Technical Paper Series, no. 960734. ^ "Brake dust". EBC Brakes. Retrieved 18 January 2014. ^ Hawk Performance. "HP Plus - Autocross & Track Brake Compound." Hawk Performance. Hawk Performance, n.d. Web. 11 Apr. 2017. Wikimedia Commons has media related to Disk brakes. Evaluation/explanation of the disc brake system, pad selection, and disc "warp"
The Austin-Healey 100 is a sports car that was by Austin-Healey built from 1953 until 1956. It was developed by Donald Healey to be produced in-house by his small Healey car company in Warwick and based on Austin A90 Atlantic mechanicals. Healey built a single Healey Hundred for the 1952 London Motor Show, and the design impressed Leonard Lord, managing director of Austin, who was looking for a replacement to the unsuccessful A90. Body styling was by Gerry Coker, the chassis was designed by Barry Bilbie with longitudinal members, in order to keep the overall vehicle height low the rear axle was underslung, the chassis frame passing under the rear axle assembly. Lord struck a deal with Healey to build it in quantity, the car was renamed the Austin-Healey 100. The 100 was named by Healey for the ability to reach 100 mph, its successor. The 100 was the first of three models called the Big Healeys to distinguish them from the much smaller Austin-Healey Sprite. The Big Healeys are often referred to by their three-character model designators rather than by their models, girling 11 in drum brakes were fitted all round. The suspension utilised modified Austin A90 components in order to be as cost effective as possible, steering was by Austins worm, front suspension was independent, double wishbone using coil springs and at the rear a rigid axle with semi elliptic leaf springs. A BN1 tested by The Motor magazine in 1953 had a top speed of 106 mph, a fuel consumption of 22.5 miles per imperial gallon was recorded. The test car cost £1063 including taxes, a total of 10030 BN1s were built from May 1953 until replaced by the BN2 model in August 1955. A1954 BN1 is on permanent display in the Bonneville Salt Flats exhibit at the Simeone Foundation Automotive Museum in Philadelphia, PA, the BN2 was fitted with a real four-speed manual transmission, still with overdrive on the top two gears. Other features that distinguish the BN2 from the BN1 are the larger front wheel arches, different rear axle. In 1955, a high-performance 100M model was introduced, with larger carburettors and it produced 110 bhp at 4500 rpm. The front suspension was stiffened and the bonnet gained louvres, along with a bonnet belt, approximately 70% of 100Ms were finished with a two-tone paint scheme, including one White over Red and another in Black over Pink for display at the 1955 London Motor Show. An electromagnet is a type of magnet in which the magnetic field is produced by an electric current. The magnetic field disappears when the current is turned off, electromagnets usually consist of insulated wire wound into a coil. A current through the wire creates a field which is concentrated in the hole in the center of the coil. The main advantage of an electromagnet over a permanent magnet is that the field can be quickly changed by controlling the amount of electric current in the winding. However, unlike a permanent magnet that needs no power, an electromagnet requires a supply of current to maintain the magnetic field. Electromagnets are employed in industry for picking up and moving heavy objects such as scrap iron. Danish scientist Hans Christian Ørsted discovered in 1820 that electric currents create magnetic fields, british scientist William Sturgeon invented the electromagnet in 1824. His first electromagnet was a piece of iron that was wrapped with about 18 turns of bare copper wire. The iron was varnished to insulate it from the windings, when a current was passed through the coil, the iron became magnetized and attracted other pieces of iron, when the current was stopped, it lost magnetization. Sturgeon displayed its power by showing that although it only weighed seven ounces, Sturgeons magnets were weak because the uninsulated wire he used could only be wrapped in a single spaced out layer around the core, limiting the number of turns. Beginning in 1830, US scientist Joseph Henry systematically improved and popularized the electromagnet, the first major use for electromagnets was in telegraph sounders. A portative electromagnet is one designed to just hold material in place, a tractive electromagnet applies a force and moves something. The solenoid is a coil of wire, and the plunger is made of a such as soft iron. Applying a current to the solenoid applies a force to the plunger, the plunger stops moving when the forces upon it are balanced. For example, the forces are balanced when the plunger is centered in the solenoid, the maximum uniform pull happens when one end of the plunger is at the middle of the solenoid. In control engineering a servomechanism, sometimes shortened to servo, is an automatic device that uses error-sensing negative feedback to correct the action of a mechanism. It usually includes a built-in encoder or other position feedback mechanism to ensure the output is achieving the desired effect, the term correctly applies only to systems where the feedback or error-correction signals help control mechanical position, speed or other parameters. For example, a power window control is not a servomechanism. By contrast a cars cruise control uses closed-loop feedback, which classifies it as a servomechanism, a common type of servo provides position control. Commonly, servos are electrical, hydraulic or pneumatic and they operate on the principle of negative feedback, where the control input is compared to the actual position of the mechanical system as measured by some sort of transducer at the output. Any difference between the actual and wanted values is amplified and used to drive the system in the necessary to reduce or eliminate the error. This procedure is one widely used application of control theory, typical servos can give a rotary or linear output. Speed control via a governor is another type of servomechanism, the steam engine uses mechanical governors, another early application was to govern the speed of water wheels. Prior to World War II the constant speed propeller was developed to control engine speed for maneuvering aircraft, fuel controls for gas turbine engines employ either hydromechanical or electronic governing. Positioning servomechanisms were first used in military fire-control and marine navigation equipment, other examples are fly-by-wire systems in aircraft which use servos to actuate the aircrafts control surfaces, and radio-controlled models which use RC servos for the same purpose. Many autofocus cameras use a servomechanism to accurately move the lens, a hard disk drive has a magnetic servo system with sub-micrometre positioning accuracy. In industrial machines, servos are used to perform complex motion, a servomotor is a specific type of motor that is combined with a rotary encoder or a potentiometer to form a servomechanism. Plymouth was a brand of automobiles based in the United States, produced by the Chrysler Corporation and its successor DaimlerChrysler. The brand first appeared in 1928 in the United States to compete in what was described as the low-priced market segment dominated by Chevrolet. The Plymouth was the seller for the automaker until the late 1990s. The brand was withdrawn from the marketplace in 2001, the Plymouth models that were produced up to were either discontinued or rebranded as Chrysler. The Plymouth automobile was introduced at Madison Square Garden on July 7,1928 and it was Chrysler Corporations first entry in the low-priced field, which at the time was already dominated by Chevrolet and Ford. Plymouths were actually priced slightly higher than their competition, but offered standard features such as internal expanding hydraulic brakes that the competition did not provide, Plymouths were originally sold exclusively through Chrysler dealerships, offering a low-cost alternative to the upscale Chrysler-brand cars. The logo featured a view of the ship Mayflower which landed at Plymouth Rock in Plymouth. However, the inspiration for the Plymouth brand name came from Plymouth binder twine, produced by the Plymouth Cordage Company, the name was chosen by Joe Frazer due to the popularity of the twine among farmers. The origins of Plymouth can be traced back to the Maxwell automobile, Chrysler took over control of the troubled Maxwell-Chalmers car company in the early 1920s, he inherited the Maxwell as part of the package. After he used the facilities to help create and launch the six-cylinder Chrysler automobile in 1924. So for 1926, the Maxwell was reworked and rebadged as the low-end four-cylinder Chrysler 52 model, in 1928, the 52 was once again redesigned to create the Chrysler-Plymouth Model Q. The Chrysler portion of the nameplate was dropped with the introduction of the Plymouth Model U in 1929, beginning in 1930, Plymouths were sold by all three Chrysler divisions. Plymouth sales were a spot during this dismal automotive period. The company bought the right to the use of the Daimler name simultaneously from Gottlieb Daimler and Daimler Motoren Gesellschaft of Cannstatt, Germany. In 1933, BSA bought the Lanchester Motor Company and made it a subsidiary of Daimler, the company was awarded a Royal Warrant to provide cars to the British Monarch in 1902, it lost this privilege in the 1950s after being supplanted by Rolls-Royce. In 1960, BSA sold Daimler to Jaguar Cars, which continued Daimlers line, Jaguar was merged into the British Motor Corporation in 1966 and British Leyland in 1968. Under these companies, Daimler became a trim level for Jaguar cars except for the 1968-1992 Daimler DS420 limousine. Jaguar was split off from British Leyland in 1984 and bought by the Ford Motor Company in 1989, Ford stopped using the Daimler name on Jaguars in 2007 selling Jaguar to Tata Motors in 2008. Tata bought the Daimler and Lanchester brands with Jaguar, but has not used them so far, engineer Frederick Richard Simms was supervising construction of an aerial cableway of his own design for the Bremen Exhibition in 1889 when he saw tiny railcars powered by Gottlieb Daimlers motors. 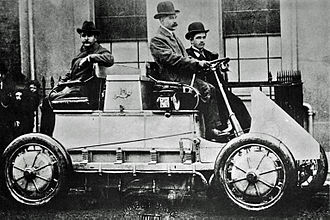 Simms introduced Daimler’s motors to England in 1890 to power launches, in an agreement dated 18 February 1891, he obtained British and Empire rights for the Daimler patents. That month, Daimler Motoren Gesellschaft lent Simms a motorboat with a 2 hp engine, in June 1891 Simms had set up a London office at 49 Leadenhall Street and founded Simms & Co consulting engineers. In May 1892, the motorboat, which Simms had named Cannstatt, hendriks severed his connections with Simms & Co. in February 1893. 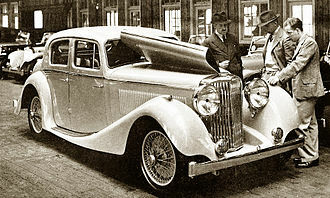 Simms Daimler-related work was moved into a new company, The Daimler Motor Syndicate Limited. Following the success of Daimler-powered Peugeots and Panhards at the 1894 Paris–Rouen competition, Simms decided to open a car factory. That month, he arranged for the syndicate to receive a ten percent commission on all British sales of Daimler-powered Panhard & Levassor cars, at the same meeting, Simms produced the first licence to operate a car under the Daimler patents. 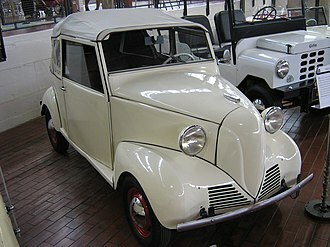 It was for a 3½ hp Panhard & Levassor that had bought in France by The Honourable Evelyn Ellis. Power-assisted ship steering systems were early users of servomechanisms to ensure the rudder moved to the desired position.